A manufacturing error discovered in a part of the Boeing Delta 2 rocket to launch NASA's Deep Impact comet striker will force on-pad repairs, further delaying liftoff that must occur during an unflexible one-month window. 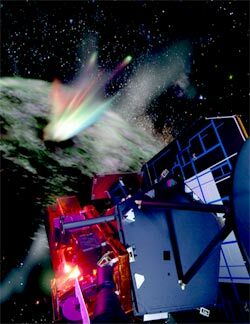 An artist's concept shows the Deep Impact mothership watching the impactor smash into Comet Tempel 1. Credit: Ball Aerospace & Technologies Corp. The mission was supposed to blast off December 30 from pad 17B at Cape Canaveral Air Force Station, Florida. But concerns with the spacecraft's software postponed the launch to January 8. The latest problem, announced Tuesday, slips the target launch date to January 12 so workers can replace part of the Delta vehicle that will send Deep Impact on its six-month trek to Comet Tempel 1. The probe must launch by January 28 in order to reach this comet, setting up a rendezvous July 4 when the mothership watches a small impactor collide with Tempel 1's icy heart at 23,000 mph. Scientists want to observe inside the stadium-sized crater formed by the impact to study the pristine materials buried in comets. If Deep Impact misses its launch window -- for whatever reason -- the spacecraft would be grounded while the mission is re-planned and a new comet is selected, possibly Comet Schwassmann-Wachmann 3. But that comet has a smaller nucleus and dustier environment, making it a much less desirable target compared to Tempel 1, Deep Impact principal investigator Michael A'Hearn said. "If we fail to make it off by the 28th, then we have to look at other possible targets. We've done some preliminary work," A'Hearn said. "There are other targets we can go to, we've looked at half a dozen different comets. Each of them is not as good as Tempel 1 in one way or another, which is why we do not want to delay the launch (past January)." "I have every confidence that we are going to make it by the 28th. 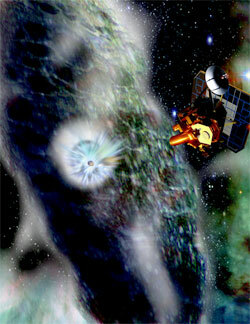 We are well positioned now," said Rick Grammier, NASA's Deep Impact project manager. "So I honestly cannot see that we wouldn't be ready to launch during the launch window that we still have remaining." The first delay was ordered after concerns were raised during pre-flight software checks. "We were looking through what we call our our parameter reviews, which is where we sit down with the engineers and go through all of the software parameters that we have to make sure they are all set appropriately. And during that review, which is why we do the review, we discovered there were a couple of parameters that were not set the way we expected them to be," Grammier explained. "So as an extra precaution, I asked for a delay in the launch in order to give us time to go back and re-run some tests that we had already completed. We wanted to go back and make sure the interaction of turning those parameters on did not affect our fault responses that we had already tested and validated. So we needed the extra time to not only run a couple of additional tests but also to review the data from those tests. "Recently, we had another delay due to some launch vehicle issues with an inter-ring. Again, in one of the extra checks that was being done, which is called the review of the engineering paperwork, the Boeing folks discovered that the interstage ring had not had an appropriate heat treatment on a portion of it. Thus, they called an engineering review board and determined that the best thing to do would be to change that piece of the launch vehicle out and replace it with one that had, in fact, done a full check and passed all of its paperwork." NASA said a Boeing engineer reviewing an "as-built" drawing of the vehicle discovered the interstage had not been heat treated to a revised higher specification. The barrel-shaped interstage is seated atop the first stage and encloses the much of the second stage during the initial minutes of ascent. Boeing has located a replacement piece and started preparing to perform the switch at pad 17B where the rocket is already assembled for launch. To accomplish the replacement, the rocket's second stage must be detached and removed from the launch pad on Wednesday. That gives access to the interstage for the adapter's removal Thursday. The new hardware should be installed Friday, followed by the return of the second stage on Saturday. Despite the last-minute glitches that have postponed the launch, Grammier said he was pleased the problems were caught. "I'm very positive on it because it shows that the checks we have implemented and put in place, actually that's why they are there. They are there to take one last look at things, make sure things are tip-top shape, and they did catch a couple of errors and that makes me feel confident that our system is working." Deep Impact is undergoing its final testing and preps at the Astrotech facility near the Cape. It will be fueled next week. Delivery to the pad for mating atop the Delta 2 rocket is scheduled for January 3. There will be two instants in time to launch January 12, separated by 40 minutes if weather or technical snags spoil the first shot. Liftoff will be possible at precisely 1:08:20 p.m. EST (1808:20 GMT) and 1:48:04 p.m. EST (1848:04 GMT). "From central Florida to the surface of a comet in six months is almost instant gratification from a deep space mission viewpoint," Grammier said. "It is going to be an exciting mission, and we can all witness its culmination together as Deep Impact provides the planet with its first man-made celestial fireworks on our nation's birthday, July 4th." "We will be capturing the whole thing on the most powerful camera to fly in deep space," A'Hearn added. "We know so little about the structure of cometary nuclei that we need exceptional equipment to ensure that we capture the event, whatever the details of the impact turn out to be." "In the world of science, this is the astronomical equivalent of a 767 airliner running into a mosquito," said Don Yeomans, a Deep Impact mission scientist. "It simply will not appreciably modify the comet's orbital path. Comet Tempel 1 poses no threat to the Earth now or in the foreseeable future."